LAHORE: The bigwigs of civil society organisations did not show up at the Allama Iqbal International Airport to receive sacked chief justice of Pakistan (CJP) Iftikhar Muhammad Chaudhry on Wednesday. MICROFINANCE has changed the life of Bushra Bibi, a mother of eight. Bushra Bibi has been making and selling vermicelli to earn her livelihood for the last 18 years. Earlier, she borrowed money from a private moneylender at a very high interest rate for her business. However, she could not earn enough to support her children as most of her income went in paying the interest. LAHORE: US Ambassador to Pakistan Anne W Patterson on Friday termed the launch of Apple Computers in Lahore, a landmark of American investors’ confidence on Pakistan. According to a press release, ambassador said, “The partnership between Apple and Raffles Systems, representing our two countries, will promote growth and prosperity in Pakistan”. She hoped this partnership and others between American and Pakistani companies would keep growing. Since 1977, Apple Computers has been a global market leader for personal computers, portable media players, cell phones, computer software and other electronic products. Apple’s popular consumer products have moved technology from the corporate world to the public. More than 80 US firms currently operating in Pakistan, were employing more than 41,000 people directly and an additional one million indirectly. The US is Pakistan’s largest investor, with more than $900 million investment in fiscal year 2007. LAHORE: The government took no heed of the public complaints regarding the poor sewerage system and unhygienic conditions of the Anarkali Food Street, which has been posing a filthy look for the last many months, Daily Times has learnt. It has been observed that the food street lacks proper drainage facility, while now and then overflowing gutters and heaps of food waste add to the miseries of the shopkeepers there. For this very reason, foreigners are no longer to be seen visiting the food bazaar, which, now, surely offers all kinds of local ‘specialties’. Mall road is one of my favorite areas of Lahore and I have some wonderful childhood memories associated with it. There is no other road like it which we all love here in Lahore, probably because it’s so close to the heart of the old city.Yesterday while driving around the mall road, I decided to look for a book shop and buy 3 books which were long pending in one of my wish-list. So driving slowly, I started to recall the old books shops where I used to buy books with my father when I was a little child. To my great surprise and shock, I could only find Maqbool Academy which is located in famous Diyal Singh Mansion and Feroz Sons. All the other old book shops were either closed or they had changed their line of business. First, I couldn’t believe that all those lovely book shops I once loved are really gone one by one but then I realized it had to happen, keeping in mind the ever dwindling lack of interest in reading book in our society. General public has lost interest in book reading and for sellers it is no longer a profitable business. 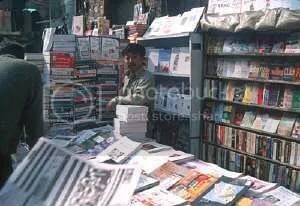 There used to be atleast 10 book shops at Mall Road only just 8 or 10 years ago but only TWO exist now. For example, there used to be one small book shop near Regal Cinema gate inside the small lane (I forgot its name), where there are two flower vendors now. Also there was the Imperial Book Depot and across from Regal used to be the Classic Book House. Then across from Cathedral and High court was Russian Book House. LAHORE: Another mark of Lahore, Landa Bazaar, famous for trading generally used articles, is dynamically keeping its attraction for middle income and the poor, both from here and other far off cities and towns, though in patches it is falling victim to a business of smuggled goods mainly coming from Afghanistan. 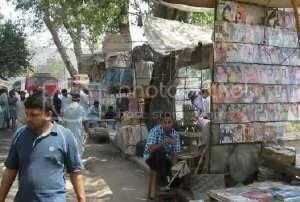 A fast spreading parallel markets of cheap and second hand articles, mainly run by pathans and the ones from the tribal belt, have already appeared at the entry points of the decades old Landa Bazaar and undermining its fame. The country’s first-ever wholesale flower market ‘Flower Exchange in Pakistan’ was inaugurated at Mini Tollington Park, on Main Boulevard, Gulberg, Wednesday.